Why don't we have a sea wall? Over the years several people have questioned why Pevensey Bay’s sea defences are being provided by a shingle embankment alone. Why was a more permanent solution like a sea wall not chosen? This article explains the differences between soft and hard engineering solutions, where soft is represented by shingle and hard by concrete and rock. Hard engineering solutions can be provided in several ways, for example by a sea wall or a rock revetment. This option is the one favoured for Pevensey Bay. Since 2002 the shingle embankment has been managed to a defined minimum width. 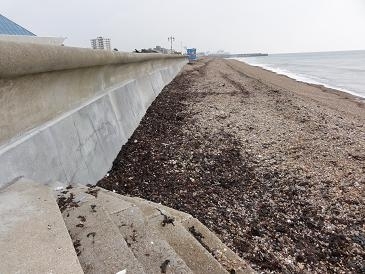 As storms have eroded beach material and moved it east by longshore drift, it has either been recycled back to rebuild narrowed defences, or replaced by annual beach nourishment. This is achieved by dredging similar sediments from the sea bed and pumping them onto the beach. The above lists are non-specific and drawn from the experiences of coastal practitioners around the country. Therefore we need to look at how construction of a sea wall would affect Pevensey Bay in particular. Since we have been following the soft option for the last eleven years, we know that on average the sea defences can be maintained for about £1,000,000 per year at today’s prices. Of course this varies year on year because all works are reactive and reflect actual weather experienced each winter. Any sea wall would need to be higher than the existing beach because there would no longer be the same width of shingle to absorb wave energy. This would mean that most crest-top properties would lose their sea view and it would be very difficult for home owners to launch boats from their own beach. Very few people would have direct access to the beach unless living directly opposite a set of steps – perhaps like the one shown below (courtesy of Havant Borough Council), which is a typical example of what could be expected. Without specific and detailed modelling of Pevensey Bay there is no way of knowing how a sea wall would affect erosion patterns, coastal processes and shoreline habitats. It is highly unlikely that any changes would be for the better. Similarly precise costs can only be estimated, but typically they are likely to be between £5,000 and £10,000 per linear metre. 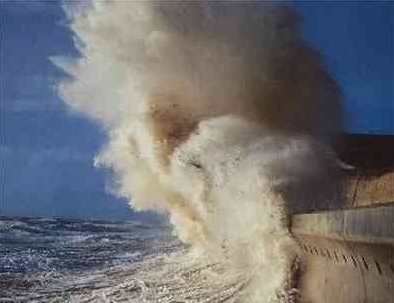 Thus for the 9km of Pevensey Bay’s sea defences a sea wall could easily cost £75,000,000. The cost of constructing a wall alone would be almost double the value of our 25 year maintenance contract. This includes no cost for maintaining a beach in front of the wall. If no maintenance were done the beach would quickly erode and wave energy reflected from the concrete wall would probably increase drift rates causing the rate of shingle loss to actually increase. Resulting toe scour could easily undermine the wall and cause it to fail. The current beach provides an amenity and no doubt the local community would want to keep something similar in place. It is conceivable that a maintenance budget of around £1,000,000 per year would still be required if an amenity beach was to be provided. It is likely that there would be an increase in the amount of sea water and small stones being blown onto properties. Once there is a concrete structure for waves to hit, far more water and beach will be flung into the air, only to be sent landward by gale force winds that usually accompany the bigger storms. It is for precisely this reason that photographers and cameramen tend to head for places like Hastings and Brighton where their sea walls produce the most spectacular shots – and more sea water behind the defences. Whilst a sea wall would increase erosion and breach protection to crest-top properties, the environmental, social and economic costs would be substantial. An eroding beach would mean that shingle plants and animals could only be able to colonise space behind the wall. If the concrete wall at Normans Bay is anything to go by then they could all but disappear from the area. Most people who live overlooking the Bay do so because they like the relatively unspoilt nature of their surroundings. They also value being able to walk straight onto the beach and launch their own boats straight into the sea. How many would consider the social upheaval of a sea wall worthwhile? Much of the UK coastline is suffering from increased erosion and rising sea levels. Government cutbacks mean that rather than increasing expenditure most departments are suffering budget cuts, so any increase in spending could only be made at the expense of other projects. 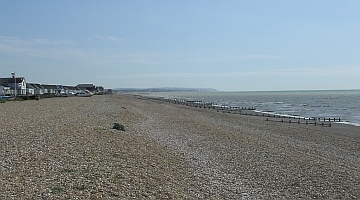 Pevensey Bay’s sea defence already offers protection for storms of up to 1:400 years against breach, twice the minimum that is generally provided elsewhere. Why are groynes not being replaced? Timber groynes have been used for well over a century to help protect our coastline and are they are now a familiar part of the landscape. In recent years there has been a move away from this method of defence. This article attempts to explain why this is the case and how alternative strategies are being used. By the 19th century shingle beaches that had built up in the 10,000 years since the last Ice Age had started to erode. In 1500AD The Crumbles extended 2km further seaward than it does today, consisting of a mass of shingle that had been driven ashore by rising tides. At first its erosion fed beaches to the east, but eventually this source was exhausted so that all areas of the coast started to erode. 150 years ago there was no real alternative but to use timber groynes in an attempt to protect communities that had developed along the coast during the Industrial Revolution. In recent decades advances in machine technology has meant that there are now different techniques that can be used, and as we become more aware of man’s impact on our natural environmental, sustainability too is a major consideration. Sustainability. Tropical hardwoods typically used for groyne construction take about 100years to grow and then probably only last 30-40 years. 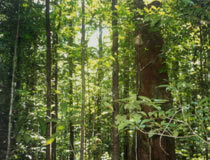 They grow in small groves and hence a lot of jungle is cleared when only a few trees are harvested. These days planning consent is unlikely to be granted for a timber groyne scheme, and there has been a move towards rock groynes, as at seen at Bulverhythe and Shoreham. Expense. A well-constructed timber groyne is not cheap. For instance those at Eastbourne constructed 15 years ago cost £100,000 each – probably £150,000 today. Pevensey had 150 groynes and we would have had to spend half the original £30m budget replacing them – a budget required to last 25 years. They don’t work quite as well as people think. If you build a groyne, it will fill with shingle, and retain that material most of the time. However, the influence of a groyne probably only stretches 60-70m updrift. Any further and it has no benefit. Whilst it is filling, it prevents beach moving down drift, thereby starving these beaches and causing further problems. Once a groyne is full, beach continues past at the same rate as it did before the groyne was built. So whilst it will hold a certain amount of beach in place, in the longer term it has minimal impact on littoral drift. Joined-up Management. Today the Environment Agency is trying to address coastal issues based on how best to manage our coasts for the benefit of the UK as a whole. Pevensey currently has a net loss of beach of around 25,000cu.m per year as prevailing wind and waves move shingle from west to east. Even with a fully-functioning groyne field, we would still need an annual shingle top-up costing at least £500,000 per year. On the other hand, once that beach has been provided, it can be used to the benefit of many. Our contract requires that we allow most of it to drift onto Bexhill, from where it will move to Bulverhythe, Hastings, Pett & Rye. So for the cost of four groynes each year we are adding benefit to a far wider area. Modern plant. Once sediments have been added to the beach they can be managed as they drift west to east. Unfortunately they rarely drift at a constant rate, plus some stretches of coast are being managed on an unnatural alignment, because a lack of planning constraint in the past allowed properties to be built in inappropriate places. Dump trucks used today carry 40tonnes at a time (about 23cu.m) so in a single day each can shift significant quantities of beach from accreting to eroding areas. If undertaken regularly, keeping haul distances low, beach can be moved for less than £2 per cubic metre. Spending money on recycling shingle rather than groyne building allows resources to be mobilised as soon as there is a problem. In this way protection of “at risk” areas can be achieved more effectively, whilst retaining the flexibility necessary to target any and every area that needs repair. They are re-using a waste product as, for instance, most granite is mined for work tops and other flat surfaces. Rock is durable and lasts a lot longer than timber. If situations change they can be dismantled and used elsewhere. They can introduce health & safety risks if the public – especially children – start climbing on and in them. Rock groynes don’t stop shingle movement and indeed sediments pass through rock structures much more than they do through timber ones. 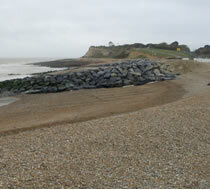 A rock groyne constructed at Bulverhythe in 2005.